The Exerpeutic 1000 High Capacity Magnetic Recumbent Bike is a sturdy and an affordable machine that could offer a comfortable workout. It has a step-thru design that allows a user to get on and off the machine with ease. To further support its stability the machine has extended leg stabilizers that prevent tipping or any sort of movement during a workout. It has got 8 level magnetic tension control system that allows the user to easily adjust the tension level for an easy or more challenging workout. The LCD display is one that has quality readability and displays workout data such as time, calories burned, time, speed, distance, scan, and heart rate. The embedded heart rate sensors on the handlebars are meant to enable the machine to display your heart rate which in turn also allows you to maintain your target heart rate zone at all times. These and more are featured in the Exerpeutic 1000 High Capacity Magnetic Recumbent Bike which will be explained in details in due course of this review. First of all, you need to know that this machine is a very popular one and most of its users are satisfied with what they got and will recommend it. This is important for you to know because when you become aware that the unit you are interested in is popular, that could have solved half of your problem or doubts concerning such machine, right? Currently, at the time this review was written, it has about 153 Amazon customer reviews (mostly verified) with an approval rating of 4.5 out 5. This is a very good indication that you should root for this machine and perhaps checkout it features to know if it suits your personality. But then, have it in the back of your mind that this unit is below $200 and therefore, should be getting what is reasonably good for the money you are paying for it. It has the precision balanced flywheel and V-belt drive that provide a quiet, consistent and smooth workout experience. It does have sensors on the handlebars that will enable a user to observe and maintain target heart rate zone at all times during workouts. This feature is something that is rarely found in other recumbent bikes of the same price range. 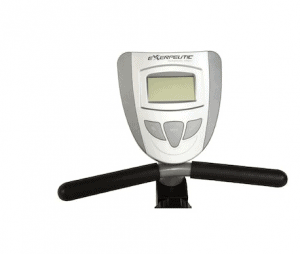 The 8 level magnetic tension control system also allows the user to easily adjust to the suitable resistance level which could be easy or challenging depending on the fitness level of the user. This also helps users to burn a lot more calories when they choose to engage in challenging workouts. The fairly large window LCD display indicates workout data such as calories burned, distance, time, speed, scan and heart rate which will also help the user to track workout progress. Its smooth torque cranking system offers smooth and consistent pedaling motion that is generally suiting to knees and ankles. The machine is undoubtedly quiet and smooth because of its precision balanced flywheel and V-belt belt. Therefore, working out without getting distracted by the noise emanating from the machine is guaranteed and you don’t also have to worry about disturbing the family or the neighbors as well and you could even watch your favorite TV shows or listen to some good music while you pedal away some pounds of fat. It has got a larger pedal design that can conveniently accommodate most individual’s feet with safety straps that are also designed to prevent foot slippage while working out. The Exerpeutic 1000 High Capacity Magnetic Recumbent Bike has an adjustable large oversized seat that is well padded and cushioned with backrest that could be suitable for users of 5 feet 3 inches to 6 feet 3 inches. 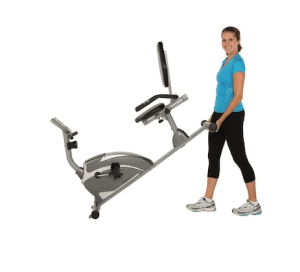 It supports up to 300 pounds maximum user weight capacity. Extended leg stabilizers that ultimately prevent any sort of movement even during a vigorous workout. There are few drawbacks of this machine which may, however, be nothing serious to some users but we shall still mention them. The resistance tension control is manually adjusted which means you have to twist the knob in order to adjust the resistance level each time you wish to do so. The placement of the tension knob is kind of not strategic because a user has to bend over in order to see knob and the level he wishes to adjust. It does not have extras such as water bottle holder, iPad/smartphone or MP3 holder. But this is usually normal for most recumbent bikes of this price range. What we love about the Exerpeutic 1000 High Capacity Magnetic Recumbent Bike is the fact that it offers comfort and stability while working out. Most of the real users have also attested that it is quiet during operation which allows them to watch TV or listen to music. There may be no special or additional feature in this unit but this is usually normal for any recumbent bike that is under $200, they all seem to be basic. But, in overall, this machine is capable of providing solid workouts that can really transform your physical health status. We also love the fact that the majority of its users have positive feedbacks, ratings and would certainly recommend it to friends. 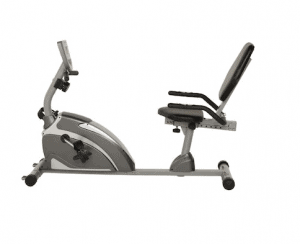 The shipping cost for the Exerpeutic 1000 High Capacity Magnetic Recumbent Bike is usually determined by the retailer you are purchasing from, however, Amazon provides free shipping for most of their products and that is including this unit. The assembly of this unit is pretty easy as the major components are preassembled accompanied by a detailed manual that will walk you through the process of assembling without any hassle. The required tools for the assembly are also included. Basically does not require any special maintenance except to wipe clean of any dust or sweat off the equipment. The Exerpeutic 1000 High Capacity Magnetic Recumbent Bike is a recommendable machine especially for those that are on a low-budget and still wish to procure a recumbent bike for home use. We must admit there are some that think that this machine is just a piece of junk but fortunately only about a percentage does. This machine is solidly built with features that can help you transform your overall physical health and achieve your goals. If you still think that you have reasons to check out other bikes, then here is our review of the best recumbent bikes of which the Exerpeutic 1000 High Capacity Magnetic Recumbent Bike is one of them. Do not hesitate to holler at us just in case you have some questions that required answers, we will be glad to respond accordingly.